A number of my friends have changed their eating habits lately. Some want to lose weight; others, with an eye on their family trees, are warding off potential genetic threats such as diabetes and heart disease. They’re all doing really well: they’re feeling and looking pretty darned terrific. They’re my inspiration. I’m not ready to strip down my diet to veganism or to give up all carbs. That is the right and proper path for some, and I support that. My approach, at this stage, is simply to cook and eat more mindfully. I try to think about the food I prepare and eat: Can I use a little less oil to sauté those onions? Add a few more veggies and a little less cheese? Substitute sorbet and frozen yogurt for full-fat ice cream? I don’t want to give up delicious food; I want to make healthy food delicious. Portion control is a major factor here as well, of course. I have installed a temporary ban on brownies in the house, since I find it curiously difficult to eat one small brownie and leave the rest in the pan. Breakfast has never been my downfall. I don’t overeat at breakfast; in fact, I often have to talk myself into eating at all that early in the morning. Still, there’s room for improvement. I’m currently switching out boxed cereals for oatmeal. Confession time: I’m an oatmeal snob. None of that prepackaged, chemical-laced mush for me. That powdery stuff in individual packets — Just Add Water! — tastes more like sugary glue than oats to me. I like my oatmeal to be just barely sweet, with the nutty flavor and pleasantly chewy texture that only real whole grains can provide. Cooking the grains in milk makes them creamy; using half water keeps them light. Oats, like pasta, benefit from a little salt, and like pasta, the salt needs to be added at the beginning so it will be absorbed. Adding dried cherries early in the cooking does three things: it allows the cherries time and liquid to plump, it flavors the oatmeal as it cooks, and it turns the cereal a delicate pink. I supported our local produce by using Door County cherries, which grow on the “thumb” peninsula of Wisconsin. They’re plump and tangy, almost (but not quite) sour. Honey adds sweetness, and vanilla adds a richness. Food 52’s website has a section called Genius Recipes, featuring head-slappingly brilliant ways to cook all sorts of dishes. There I found April Bloomfield’s English Porridge. The genius is in the combination of steel-cut oats for chew and whole rolled oats for creaminess. I changed the sweetener from brown sugar to honey and added the cherries and vanilla. I also added the steel-cut oats to the cold liquids in the saucepan before it’s heated, then stirred in the rolled oats a few minutes later. This allows the rolled oats to hold their shape but the steel-cut oats to be tender. 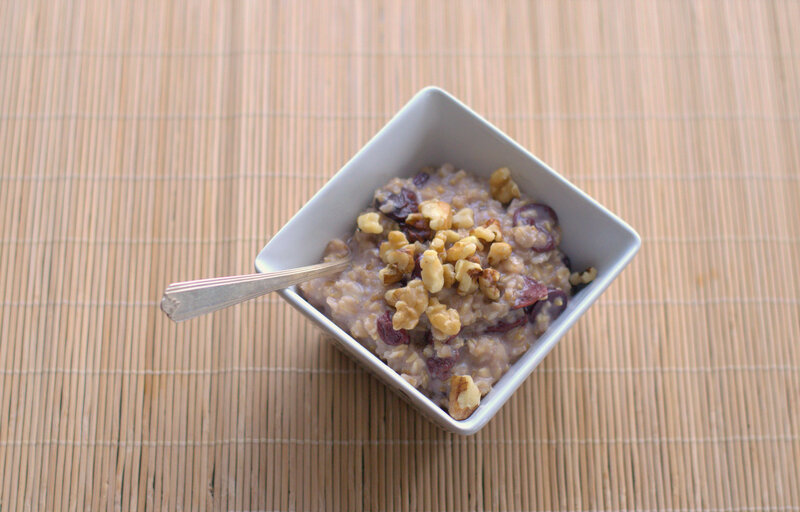 You can use any dried fruit, or add fresh fruit to the cooked oatmeal at the table. Substitute brown sugar, agave, or maple syrup for the honey. Stir in a tablespoon or two of wheat germ before or after cooking. Skip the vanilla and add a pinch or two of cinnamon or nutmeg or (my favorite) coriander (the ground seeds, not the fresh herb that we call cilantro in the US). I make a full recipe and store the leftovers in the fridge. The next morning (and a few mornings afterward), I scoop out a little oatmeal, stir in a tablespoon or two of milk, and heat for about a minute in the microwave. Or I stare at the empty spot in the refrigerator where the oatmeal used to be, before my husband and son found it and devoured the lot. Reduce heat to medium-low and cook, stirring often, for about 20-25 minutes until the oats are tender but still a little chewy and the liquid that isn’t absorbed is creamy. Serve topped with whatever makes you happy: honey, brown sugar, a splash of milk, a handful of nuts. Leftovers will keep in the fridge for a few days. Reheat in the microwave with a little milk. This entry was posted in breakfast, pasta, rice, and grains and tagged cereal, dried cherries, healthy cherries, oatmeal, oats, porridge, vegetarian. Bookmark the permalink.